When you run a business, your main goal will be to become successful. You’ll want to do everything you can to handle big clients and you will also want to take things to that next level with you incoming payments as well. The problem is that you are not going to get any big clients if they don’t believe that you have the resources to handle their needs, and even if you do have everything, it’s important that you look the part as well or you can’t hope to get anywhere. Your website is quite possibly one of the first things that your clients see. When they look at your website, they will essentially be weighing up whether or not your company is worth their time and money. If you don’t have a great website then you are going to be essentially shooting yourself in the foot, by turning away good business when this could have been completely avoided. You may think that as a small business, you don’t have the time or the budget to invest in a good website designer, but in reality you need to prioritise this over everything else. Your website needs to make you look impressive, while also setting the foundation for the future of your brand. Social media is ideal for offering discounts and deals. You need to keep your brand consistent if you want to make the most out of what it has to offer, and if you are able to do this then your customers will trust in you a lot more. When you have a consistent brand, everything else will fall into place and this is a brilliant way for you to take your company to that very next level. If your company is solely online then you will understand how annoying it is to get asked to enter your own personal address every time you have to sign up for something. Customers don’t want to see where your personal house is and they don’t want to show them either, so a PO box is well worth the investment. If you want to get this done then look into a private online PO box and this is the best way to keep the cost down while also boosting your own company image. When you run an e-commerce store you will know how stressful it can be to get all of the products you need, shipped out on time. If you want to appear like you have everything under control while also looking like your company can sustain itself, you need to be efficient in your shipping process. If someone receives their item in 5 days’ time, this is a rather long wait and it makes it look as though you are behind on orders, even if you’re not. Aim for 24-72 hour delivery on all products, and run your shipping process like you do your business. Everything needs to be efficient, so it looks like you can handle your own business load and then some. My family has always enjoyed eating a lovely soup or stew during the cold months. In fact, I can get both of my grown up kids home for dinner very easily by announcing I am making beef stew, pot roast, or chili. They will rearrange their schedules to be home for dinner on those nights. And if any of you have adult children who have busy lives you will understand what a feat that is! Now we can add a new meal to the “whole family home for dinner” line up. 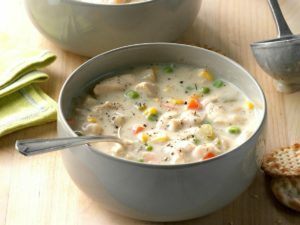 Creamy Chicken and Rice Soup! 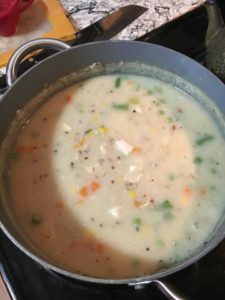 I was actually surprised both of my young adult sons loved this soup so much! But they did, and even the leftovers were eaten. ALL of them. I don’t know if your house is like my house, but in my house the leftovers usually sit and sit until eventually either I eat them or they get fuzzy. For some reason my family thinks that leftovers don’t taste good. I will admit they don’t taste as yummy in the microwave, but if you heat them in a pan they are just as good as the first time, and sometimes better because the flavors have had a chance to “shake hands”. 1) In a large saucepan cook the cubed chicken in ½ tablespoon EVOO until it is browned. Remove chicken from pan and set aside. Pour the remaining ½ tablespoon EVOO in to the pan and add the onion, celery, and garlic. Cook until the onions are translucent (about 3-5 minutes) and add the carrots. Sauté for about 3 minutes. 2) Add in the Chicken broth, rice, and frozen vegetables, stir well. Then add the cooked chicken to the pan. Bring to a boil, and then reduce heat and simmer with a lid on the pan for 15-20 minutes. 3) Mix the flour and milk in a container with a lid and shake or stir well to create a slurry. Pour into the soup while stirring to thicken the soup. Add Flour/milk mixture to desired thickness. Heat through and serve. With around 110,000 e-commerce stores out there that are generating a meaningful income, there is a lot of competition. However, opening your own e-commerce store enables you to reach a much larger audience, meaning that your physical location isn’t that influential on what you’re selling. The aim for most stores is to have both an online store as well as multiple physical stores. 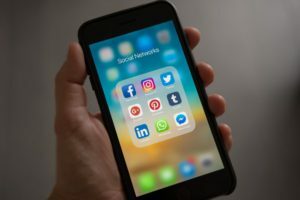 But to start things off, in our technology-filled world, the best way to go about it is to be online and to focus on online advertising and marketing for a while. Eventually, you will get to a point where you will be advertising offline too, and this will most likely happen before you open a physical store. And then you might decide that a physical store isn’t for you; look at boohoo.com, an extremely successful e-commerce clothing store that could very easily succeed on Main Street, but chooses not to. No matter what your industry is or what products that you are going to be selling, every online store needs to follow some of the same rules as a brick and mortar startup. Not only do you need to think about your website, online advertising and marketing, but you also need to think about your production, your storage and shipping, and also your employees. 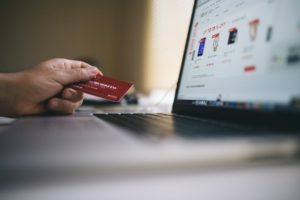 Here are 4 Tips For Creating An E-Commerce Store. Your website has to be perfect. In a physical store, the customer can see and handle the product, online they have to trust that the quality of the materials are top notch. You need them to trust you, and if you have a half-functioning website that looks like it was built in the 2000s, you’re not going to earn their trust. 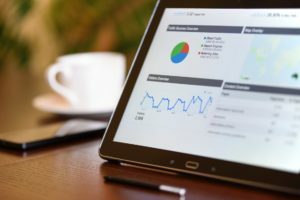 You can easily build a website yourself with platforms like GoDaddy.com and WordPress.com, but to have it functioning the way you need it to be, you might want to consider hiring a web designer put it together for you. These people make their living through creating e-commerce sites and you can trust that the finished product will be exactly what you want it to be. When designing your website, you need to think about the aesthetic of your company. You will find that your color scheme, logo choice, and even your company name will have an impact on your audience. Stay true to your product – if you sell urban clothing, then keep to an urban theme, if you are a custom skateboard company, then think about incorporating skating images and graffiti art into your site. The arrival of the product to your customer is incredibly important, which is why you should always look to use a third party company like RedStagFullfillment.com. If you use a smaller delivery or courier service, you might find that your product isn’t being delivered on time or might even arrive damaged. That can be harmful to your business. So choose a trusted company. No matter what your product is, you are going to need space to store it. It might even be a space in your home. Or you may need to think about renting a space. You can rent a storage unit for excess stock, or maybe you even need a large warehouse. Whatever your storage needs, make sure that you get insurance for your product and use extra security measures. As a minimum, have CCTV installed throughout your storage space. For a startup business, you probably won’t need many, if any employees. However, the workload can get a bit much if you’re on your own, so look into outsourcing work where you can. Like your web design and upkeep, your product descriptions can go to a freelance copywriter, and your photos can also be done by a freelance photographer. Although outsourcing is different from having traditional ‘employees’, you are still paying people to do work for you, which means that they are in your employ. Having unique content and photographs marks your store as professional and, therefore, trustworthy.